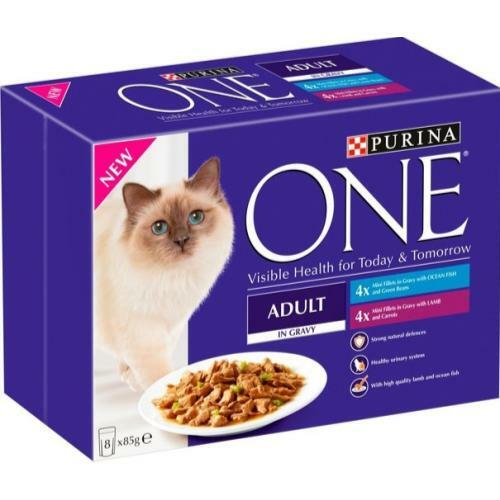 Purina ONE wet meals come in pouches and have been developed by Purina Vets and Nutritionists so your cat can remain healthy with all the necessary vitamins and minerals. Made with high quality ingredients the tasty lamb or yummy fish promotes protein and great taste. Antioxidants such as Vitamin E helps maintain strong natural defences, added fibre proven to support good digestion and minerals to keep your cat’s urinary system healthy by reducing the concentration which can lead to urinary stones. Meat and animal derivatives, vegetable protein extracts, vegetables (5% from dried green beans), fish and fish derivatives (of which ocean fish 4%), derivatives of vegetable origin, minerals, oils and fats, various sugars. For an average cat of 4 kg, feed 3 to 4 pouches per day in at least 2 separate meals.